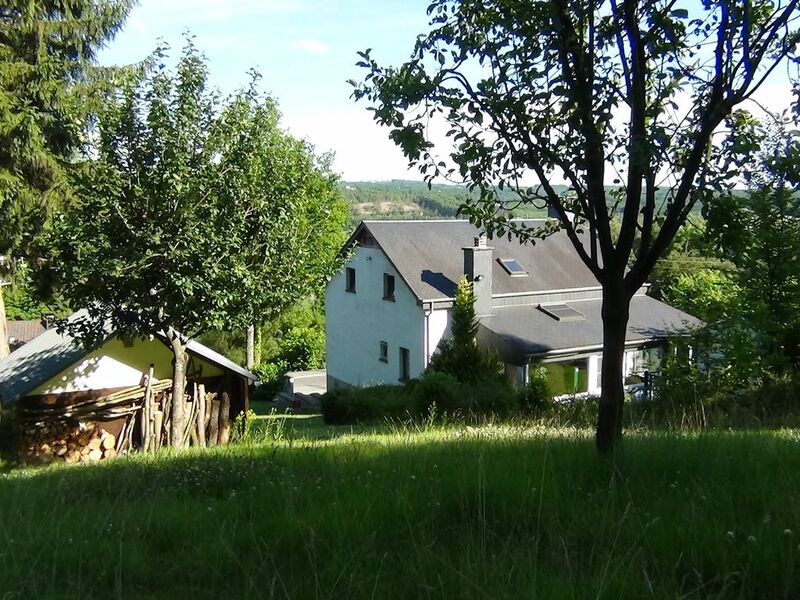 This large luxury detached house is located on the side of a hill with a wide view of the village and the Ardennes hills just a stone's throw from Durbuy. With its 5 bedrooms (12 beds + cots), 2 bathrooms, 2 separate showers and 3 toilets, it is ideal for family weekends or holidays. Enjoy the comfortable house with sunny terraces and the fully fenced garden with garden furniture and 2 barbecues together with your family or acquaintances. Take a break and enjoy the most beautiful part of the Belgian Ardennes. The hilly landscape will give you wonderful panoramas and authentic villages during your walks. The Ourthe and other small rivers meander through the valleys. Here you are really on vacation. Durbuy, the smallest city in the world, is 3km as the crow flies. You can walk to it over the hill or by car (about 6 km). Also worth a visit to a castle or the discovery of one of the caves (Hotton, Han, Remouchamps). Do you want more on the sporting tour? There are several large adventure companies in the immediate vicinity, including Durbuy Valley, the largest adventure park in Wallonia at only 3 km. You can book there for kayak, mountain bike, adventure and more. And the Durbuy golf course is 3 km away. Furthermore, there is the golf course of Mean at about 10 km. • fitness room with bicycle, treadmill and power bank. • In short: everything is there; you will not misunderstand anything. In the fully fenced garden of 2000 m2 there are 2 terraces around the house with garden furniture and 2 BBQ's. There is also a playhouse on stilts for children and with a sandpit, slide and a real veranda. The house is heated with a central heating system, but you can also light the wood stoves for conviviality. There is parking for 5 to 6 cars at the house. Many of our guests are very enthusiastic about this luxury holiday home and have already returned many times. There is so much to discover that a weekend is often too short. Please read our guestbook. On the bedroom floor the large bathroom has a toilet. But there is also a separate toilet in the hall.